Never heard of Edwards even though they've been around since 1950? yeah, me neither. Now, don't get me wrong, it's often the new guy on the block who has something to prove, and today, well, the "new" guy has brought something mighty unique to the table. For $2.25 for 2 servings, I humbly present Edwards Singles (one of those new treats I mentioned in my monday post). Now I saw 2 or 3 varieties of singles and I decided to start with the turtle one. I couldn't resist for two reaons. 1) it said NEW! and 2) it's unique. It's funny because they could have "embellished" the picture on the box, but I feel it's actually a pretty acurate image. (hahahahaha, I just typoed "accurate", how ironic....that's what I get for staring at the box and not my monitor.). Ok, let's run with the pictures. As you can see, this is going to be a two part process. after 50 seconds at 70%, the brownie's done! 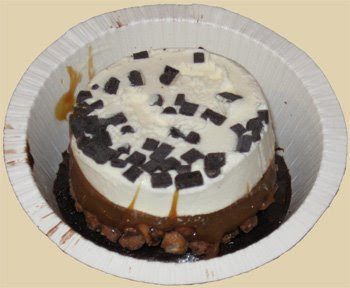 now flip the ice cream cup upside down and push on the bottom. Waalaa! it's done! and tasty to boot! I'm going to have to give this tasty invention two spoons up. It's simple to do, it's a decent value, (you cook in cardboard and not plastic), and the end result is respectable. As you may suspect, the ice cream isn't top notch, but we're not here to eat ice cream. No no, we're here to grab a nice spoonful of sundae: mild ice cream, chocolate chips, a decent caramel sauce, pecans, and an ooey gooey brownie. Actually, I want to give props to the brownie here. It's hot, it's fresh, and they threw in these dark chocolate chunks that truly make the brownie both ooey and gooey when they melt. 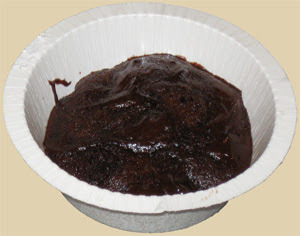 Ya know, I haven't thought about microwave brownies since the early 90s...I think they had microwave cookies as well, but I can't remember what they were called. Good job Edwards, you've presented a well thought out product. Update: Somebody mentioned a commercial, well here it is: Edward's Commercial. This is so funny. I just saw this commercial and it was funny because we had just finished brownie with Dryer's Loaded Caramel Cone Crunch and sprinkled walnuts on top. Baking an 8"x8" pan of gooey brownies and topped with an actually delicious ice cream (on sale 3/$10 at our local albertson's for 1.5 quarts) is hard to beat at any packaged frozen dessert price. My boyfriend says it's really not that hard to throw "store bought ice cream on top of brownie". Well sure it easy to make a pan of brownies, but this does seem like it is quicker. I personally haven't tried this yet but I also know how easy it is to eat a whole pan of brownies so a little forced portion control is also appealing. I tried this after seeing this at my supermarket although it cost me 4.99 I thought it looked good, but that was just the picture on the box. It was over frozen and the ice cream was like one of those little Jack and Jill ice creams you get real cheap. This is not something I would recommend. @Anon 2: HA! When brownies are fresh, portion control is very hard! @Anon 3: Oh man, $4.99?! That's a ripoff! My apologies to your wallet.